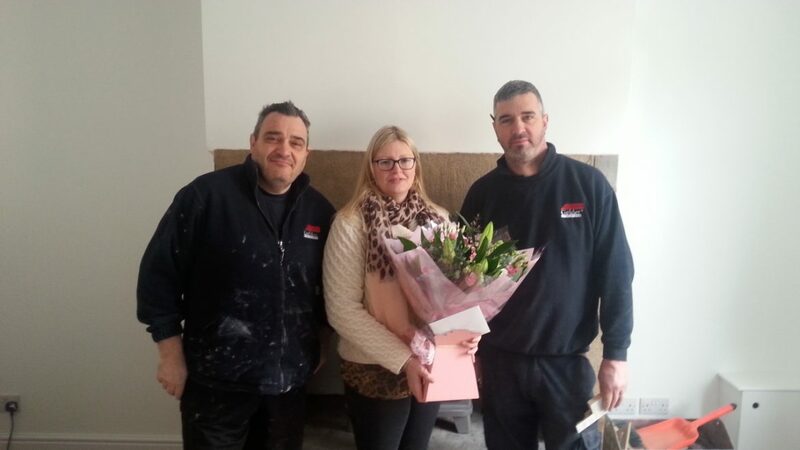 Joanne Wood being presented with flowers from Gelder Tradesman. Only eight weeks after Lancashire was hit by Storm Eva, policy holder, Joanne Wood is back in her property with the help of Gelder Group and Ellis May. Joanne Wood was delighted to be back in her property and sent a personal message to convey her thanks to the team at Gelder Group. Just to say a huge thank you to the Gelder Group for the efficiency of putting my house back together. Both Mark and Kevin worked hard to get the job done on time and to a high standard. Thank you also for coordinating the whole process. The continual communication from start to finish has been greatly appreciated and gives peace of mind with the situation. Our teams are working hard within the areas affected by the storms, returning policy holders to their homes as swiftly as possible. If you would like more information about our Insurance division and the work they’re involved in, please get in touch.